Yesterday’s announcement by Warren Buffett and Bill Gates about the Giving Pledge — their challenge to fellow billionaires to join them in giving away at least half of their fortunes to charity — certainly had dramatic impact. And it promises to give a huge boost to the world of philanthropy, to say the least. But the move may not be as surprising as it may seem, given both Buffett’s and Gates’ gravitas and deep and abiding commitment to philanthropy. Buffett, chairman and CEO of Berkshire Hathaway, has long held that he plans to give away most of his wealth. He announced in 2006 that he’d be donating 99% of his earnings to good causes. “I am not an enthusiast of dynastic wealth, particularly when the alternative is six billion people having that much poorer hands in life than we have, having a chance to benefit from the money,” he told the BBC at the time. And Gates, who co-founded Microsoft with Paul Allen (another of the 40 pledgers) has devoted the last decade to running the Bill & Melinda Gates Foundation in concert with his wife. With an endowment of some $33.5 billion, it’s arguably the largest and most powerful private foundation in the world. So far, after soft-peddling the Giving Pledge in the rarified world of great wealth, 38 American billionaires — about half the number they’ve asked to date — have already signed up. 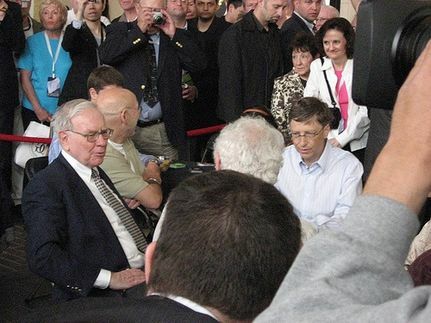 Buffett and Gates, two of the richest men in the world, launched the Giving Pledge six weeks ago. It’s been in the works for over a year though, following a series of secret dinners and meetings Gates and Buffett convened with fellow philanthropists. Their timing couldn’t be better. The world of philanthropy is just beginning to recover from the fallout of the recession and credit crunch, which has hit charities hard these past few years, despite the fact that according to Forbes, “the US outdoes all other countries in philanthropic generosity.” In 2009 alone, giving to non-profits fell 3.6%, from $315 billion to $303.6 billion according to a report published by the Giving USA Foundation, worse than the 2% drop in 2008 to $307.7 billion. To get the Giving Pledge going, Buffett said that he, and Bill and Melinda Gates took the Forbes 400 list of wealthiest Americans and started dialing. (Gates ranks first and Buffett second on the list, in case you were wondering). In addition to Buffett and Gates, the list ranges from headline names, to those not as well known beyond financial circles. It includes Michael Bloomberg, George Lucas, Ted Turner, T. Boone Pickens, Ron Perelman, Larry Ellison, David Rockefeller, and Barry Diller and Diane von Furstenberg. Next up, Buffett and Gates are asking their co-pledgers to start making their own calls, as well as hold small gatherings across the country to encourage more people to sign up. Over time, the total could amount to well in the hundreds of billions of dollars, given that the pledgers so far have a combined net worth of over $200 billion. The question is how it will be spent. Each donor is free to disperse his or her money as he or she sees fit. Traditionally, big, established “old money” has sunk its donations into big, established foundations, and the reasons for giving indeed do range from the altruistic to the mercenary. To stave off the cynics, Buffett claims tax breaks are not the reason people are taking the pledge. Think about this, too: the Giving Pledge group includes a good number of visionaries with new ideas and “new money” — and they’ve been backing social entrepreneurship and causes ranging from education and health care with a vengeance. It’s an elite bunch to be sure. The question is will the Giving Pledge now become the elitist of the elite — the club every billionaire feels the need to join? How great would that be? I do get upset at people that seem to just 'know' what welfare people do with their money. some people in here are being rude to the poor. the middle class is needed, yes i know that. But the poor do not need to be 'classed' as always being rude defilers to money. I have been 'poor' most all of my 69 years. That was because I thought helping others and getting people well would help fix some of the issues in our society. I have been considered to be a humanitarian. We don' t get payed for doing that in this country. As a single mother i had to go one welfare for my child to have any parenting. She used to fall asleep with her face in her dinner trying to stay awake to see me after I got home from work..So I stayed home with her. Not all the poor people are rude. 5 Now Millennials Are Killing the Middle Class!